IBM SmartCamp, powered by LAUNCH. 30 cities worldwide. Get mentored, pitch on stage, compete to win investment from Jason Calacanis & win IBM Global Entrepreneur of the Year. Apply at smartcamp2016.com. 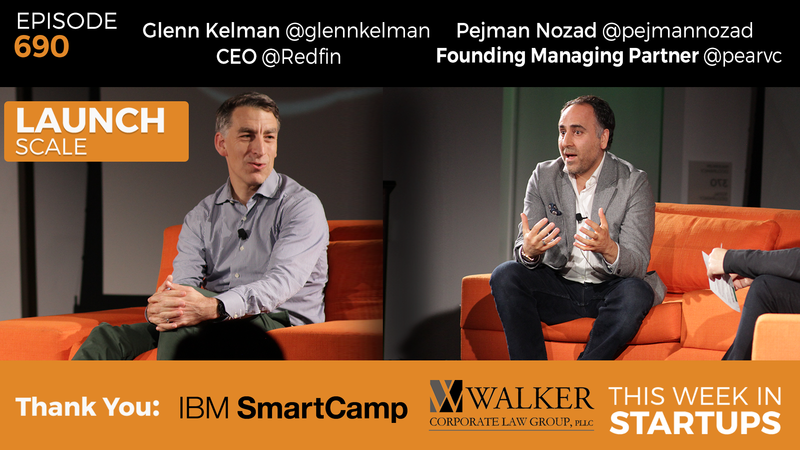 Filmed at 2016 LAUNCH SCALE, Glenn Kelman of Redfin and Pejman Nozad of Pear.vc sit down with Jason and share how their stories of staying obsessively focused and persistent led them to building great companies. Glenn Kelman demonstrates how Redfin is reinventing real estate in the consumer’s favor, with the goal of restoring honor to the otherwise underappreciated profession. Then, Pejman Nozad takes us on his 20-year journey that started when he got a job at a car wash in San Jose while living in an attic above a yogurt shop, to then selling rugs, closing sales — $8 million worth of rugs in his best year — and starting a tech venture fund. 07:12: lessons learned: most features don’t matter. 22:15: When was the tipping point for when this is going to work? 37:38: How did you get started? 48:05: How did you become involved in Dropbox? 56:29: Vision – How do you guide founders to have both the big vision and solve a real problem? 01:00:06: What’s your biggest personal challenge in life these days and how do you try to tackle it? 01:00:51: Did the trojan horse factor play a role in venture capitalism? 01:03:16: What draws you to actually accept a meeting?